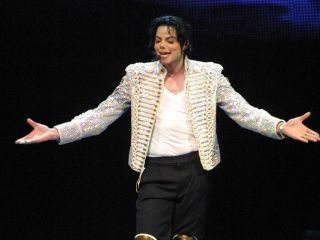 Michael Jackson on stage in 2002. Bee Gee Barry Gibb has released a video clip of him collaborating in the studio with Michael Jackson in 2002. The footage shows the pair at work on a still-unreleased song, All In Your Name. Commenting on the recording session in question, Gibb says: "Michael Jackson and I were the dearest of friends, that's simply what it was. We gravitated towards the same kind of music and we loved collaborating and he was the easiest person to write with. "The more we got to know each other the more those ideas entwined and it all came to this song All In Your Name. All In Your Name is in fact the message that Michael wanted to send out to all of his fans all over the world that he did it all for them and for the pure love of music. I hope and pray that we all get to hear it in its entirety. This experience I will treasure forever." Gibb goes on to say that the session took place at The Bee Gees' Middle Ear Studios in December 2002 and that the footage (of which there is more than two hours) was captured by his son Ashley. The clip was originally posted on Barry Gibb's website. It remains to be seen whether or not All In Your Name will be released.